Anyone want to go out for a bite after work? The second chapter of the Zombie Lab story expands the world quite a bit, but it still doesn't identify any specific zombies (other than Dr. Banner, and it's not like he had a lot to do). Of course, I've been re-reading World War Z lately, and there's a bit in there where it's revealed that part of the military training teaches the servicemen and women not to try imagining who the zombies had been when they were alive - it's a great way to get distracted, then bitten, and then somebody's wondering who you had been when you were alive. On a partially related note, can you think of any property where the gulf between the quality of the source material and the quality of the adaptation is as wide as World War Z? The book was excellent, but the movie was... not so much. Really, the only way to do it right would have been a "Ken Burns"-style multipart documentary, but Netflix wasn't as strong in their original content game at the time, so the world misses out. Your best choice is to get the "Complete Edition" audiobook, which is fully voiced by professional actors and features the entire story. Anyway, on with the review. 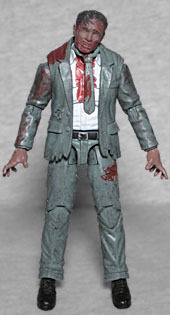 This nameless zombie was once a businessman, or at least someone who wore a businessman's clothes: below the neck, he gets all the same molds as Zombie Banner, simply repainted to turn a labcoat into a business jacket. The molds work just as well for this application as they did for the Doc, with the jacket being tattered and rumpled, and the small slash in the pantleg making it clear this is more than just a guy having a single bad day. The figure also comes with a necktie accessory, but since the shirt's collar is open, it doesn't look perfect when you slip it in place. Of course, Dr. Banner had been safe inside Lab 51, while this guy was apparently out in the wild - so while Banner was clean and pristine, Zombie 001 has blood on his shoulder and right arm, around the cut on his leg, and running down the front of his shirt. A section of his upper lip has been ripped away, but the toy still gets no paint on the eyes. Is that just the way zombies are in this world? Not blank eyes or red eyes, but flesh-colored eyes? Zombie Lab licensed the Vitruvian HACKS design for their toys, so the zombie moves with swivel/hinge ankles; double-hinge knees; balljointed hips; a balljointed torso; swivel/hinge shoulders, elbows and wrists; and a balljointed head and neck. The joints were all a little stiff, thanks to the way the paint was applied, so the hinges all started moving with a small (and only partially worrying) "snap!" Nothing broken but the seal created by the paint. The toy gets the open, clawing hands that are de rigueur for the zombie figures. Or should that be "de rigor-mortis"? 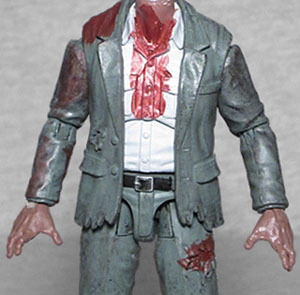 Predictably, Zombie 001 has the exact same as accessories every other zombie, whether they make sense or not: the exposed entrails and the severed spine, plus a display base and a human arm snack. And the tie, naturally. 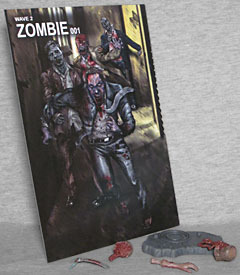 The card art helps sell the idea that this is an army-builder toy, because it shows four business suit zombies coming down the hallway (alleyway?) toward you. Maybe they're a group of coworkers who had gone to a karaoke box after work, and somehow all got infected while in their rented room. Now some human has tried to hide in the bar, and the zombies have broken out in search of a new meal. 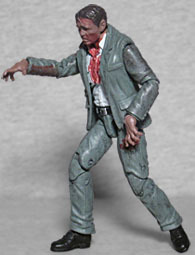 It's weird that the Zombies don't seem to get any eye paint, but for a "generic" ghoul, this is a nicely gross figure that's ready to be dispatched by your heroes.